~Green Bay — In the still-stinging aftermath of the most heartbreaking loss in Green Bay Packers history, there is no room for diplomatic, tip-your-hat-to-them clichés. No. Players on this defense know they punished the smashmouth Seattle Seahawks…. for 56 minutes. They picked off Russell Wilson four times. They stuffed running back Marshawn Lynch. They made undrafted receivers resemble undrafted receivers. Ask defensive players about the 28-22 overtime loss and a palpable anger returns. At Liberty Café in downtown Green Bay over a cup of coffee with Sam Barrington. In New Jersey, where B.J. Raji was training before signing his new contract. He was a spectator that day. It was the lowest low of his rehab from a torn bicep tendon. Defensive end Mike Daniels has been replaying the film. So if you’re the Packers — armed with the 30th overall pick in the 2015 NFL draft — you do everything possible to sharpen this edge on ‘D.’ Maintain it. Strengthen it. There’s an ornery, irritable core of playmakers here in Daniels, Barrington, safety Ha Ha Clinton-Dix, outside linebacker Mike Neal. The Packers need an inside linebacker next to Barrington to let Clay Matthews do what he’s paid $13.2 million per year to do — bruise quarterbacks. The Packers must nail this choice, too. After skating by at the position on low-cost deals, it’s time to invest a first-round pick. Have you seen AJ Hawk or Brad Jones do this? UCLA’s Eric Kendricks is the instinctual tackling machine. Clemson’s Stephone Anthony, of 4.56 speed, could be a blitzing missile. Dawson plodded through the events. Your local postal worker could probably top Dawson’s time of 4.93 (30th among linebackers) and 28-inch vertical leap. Position drills were clunky. Then, you turn on the film. Dawson is a different breed inside. The Packers need to stop the run better, obviously, but they also want an ILB who can play 3 downs, and Dawson’s pass defense is solid at worst, as seen here and previously. While his combine times were abysmal, his play on the field is on par with last year’s first round picked inside linebackers Ryan Shazier and CJ Mosely. This pick would not be a reach whatsoever. Last season, the Big 12 defensive player of the year had 136 tackles (20 for loss), six sacks, four interceptions and two forced fumbles. In a conference that spreads linebackers thin — how NFL coordinators scheme each game, a point of concern with Denzel Perryman and Benardrick McKinney — Dawson maintained a cruel, downhill playing style while holding his own in coverage. The Horned Frogs’ 42-3 decimation of Ole Miss should replay in war rooms. Not the latest installment of men in tights. He routinely shoots the right gap to stalemate Jaylen Walton (8 carries, 3 yards) at the line of scrimmage (as seen below). Look at Dawson sniff the run out. He shoots the gap, takes on the pulling guard and shoves him aside, and he meets the ball carrier for a 2-yard loss. This is a strong, nasty man who would relish the chance to smack Marshawn Lynch in the face. He reads a play fake to the back to instantly race upfield and sack Bo Wallace at the Ole Miss 1-yard line. He then shakes off a lineman’s block to blitz and drill Wallace in the end zone on a pick-six. Dropping the hammer, staring down at his victims, he made more plays in single games than many draftable linebackers did the entire season. So of course Dawson took to Twitter (what else?) shortly after his combine dud. The Packers took a workout wonder before to play linebacker: Nick Perry. But even the team’s own scouts had to be concerned that Perry disappeared for stretches in college at USC — not the case with Dawson. He stands out every possession. This prospect does require a deep background check. Destroying the Minnesota QB. How would you like to see him continue to destroy Minnesota QB’s twice a year for the next decade? Early in his career at TCU, Dawson would show up late for meetings. He was, basically, a bizarro A.J. Hawk. Tardy. Unfocused. By his senior year — having a daughter in the process — Dawson insists he corrected the problem. Before every draft pick, Packers general manager Ted Thompson asks the room how that player would fit into the locker room. Arrests, headaches, malcontents to any degree are rare in Green Bay. Of course a player who is rough around the edges, who does come with that “character concern” tag could also be a welcomed addition. Dawson rides the fine line. He was the heartbeat of one of the nation’s top defenses. One of Dawson’s best traits is his ability to keep himself clean from blockers. Whether he beats them with his feet by laterally shuffling around them, or whether he beats them with his hands by swiping and keeping their mitts off his chest, he’s able to stay alive, stay square to the line of scrimmage and bring the ball carrier down (as seen on this clip via NFL.com). The Packers’ defense was hyped up, and then some, the final two months of the 2014 season. Now, management needs to keep it that way. ~Packer Nation is lathered up, per usual. Two cornerbacks have left town. There’s precious little depth at inside linebacker. Tight end remains a minor concern. But truth be told, when the NFL draft begins April 30, Green Bay’s needs pale in comparison to the rest of the league. At least a dozen teams would love an upgrade at quarterback. Most teams look at Green Bay’s offensive personnel and salivate. Heck, just compare the Packers to the top teams of 2014. Super Bowl champion New England lost its two starting cornerbacks, potential Hall of Fame nose tackle Vince Wilfork and two high-quality running backs in free agency. NFC champion Seattle could use two starting-quality wide receivers and a huge upgrade on the offensive line. Dallas, who many considered the fourth-best team in football, has a glaring need at running back and holes throughout its defense. And AFC runner-up Indianapolis has a below average defense and a mediocre offensive line. Compared to their brethren across the NFL, the Packers are in relatively good shape. But if Green Bay is to take the next step — and return to a Super Bowl for the first time in five seasons — Thompson has to be at his best next weekend. Green Bay holds the 30th overall selection, as well as its own pick in all seven rounds. The Packers also have two compensatory picks in the sixth round. With a relatively stacked roster, it would be hard for Green Bay to carry nine rookies in 2015. So this could be a draft where Thompson moves up for a player he covets, much like he did in 2009 when he nabbed outside linebacker Clay Matthews. If the traditionally conservative Thompson stays put — as he does most seasons — there will be several players at No. 30 that could provide immediate help. Here’s a look at 10 players who could intrigue Thompson and be Packers by the end of the night on April 30. Played cornerback and safety at Utah. But with 4.45 speed in the 40, most teams project Rowe to be a corner at the next level. Rowe has the size (6-foot-1, 205 pounds) and physicality to disrupt receivers at the line of scrimmage, as well as impressive closing speed. He’s strong in run support and has a toughness about him that’s impressed scouts. Rowe had just three career interceptions and three pass breakups at Utah, though, raising many questions about his ball skills. Jones recently ran the 40-yard dash in 4.36 seconds at UConn’s pro day and could be long gone when Green Bay drafts. That’s because Jones also set a world record in the standing broad jump (12-3) at the NFL combine — that’s right, a world record — and displayed a remarkable vertical jump of 44.5 inches. The lanky Jones (6-1, 199) began his career as a two-year starter at safety. But personnel losses caused the Huskies to move Jones to cornerback in 2014. Jones flashed early in the year, then underwent shoulder surgery in October that ended his final season. Jones has the athleticism and length to be a terrific NFL cornerback. But he lacks experience at cornerback and doesn’t always play to the remarkable testing numbers he produced. “It was awesome,” Jones said of the NFL combine. “Just to perform your best at the biggest stage. I had all of my life to prepare for this, and in the end all you can ask is to have an opportunity to do this, and to perform like that and to set a personal record is a great feeling. Thompson has always stressed character when it comes to his draft picks. And in the wake of the Aaron Hernandez saga, it should be more important than ever. So would Thompson gamble on a player like Peters? It’s doubtful, but never say never. Peters (6-0, 197) is arguably the most talented cornerback in this draft. But he was kicked out of the Washington program last November after multiple clashes with the Huskies coaching staff. Peters ran a 4.53 40-yard dash and did 17 reps of 225 pounds on the bench press. His ball skills and awareness are considered outstanding. Peters’ checkered past could take him off some draft boards altogether. He’s also been inconsistent in coverage. Collins has a terrific size (6-1, 203) and speed (4.48) ratio. He also showed impressive burst in running down Wisconsin’s Melvin Gordon in the open field after a 65-yard run last season. Collins is extremely inexperienced, though, and made just 10 career starts at LSU. Although the Tigers rotate personnel in the secondary, Collins was up and down and lost his starting job at times. With former starters A.J. Hawk and Brad Jones gone, the Packers have a huge need at inside linebacker. And Kendricks — regarded in many circles as the No. 1 player at his position — figures to still be on the board. Kendricks (6-0, 232) lacks ideal size, but he has terrific instincts, is light on his feet, and packs a greater punch than his frame suggests. But Kendricks rarely takes on blockers, instead relying on his agility to shed them. Kendricks’ brother, Mychal, plays for Philadelphia and has similar measurables (6-0, 240). And in three seasons, Mychal has made 40 starts, has 201 tackles and nine interceptions. Seen by most as the No. 2 inside linebacker in the draft after Kendricks. But McKinney is 4 inches taller and 15 pounds heavier than Kendricks, and if Thompson wants a thumper, this would be his man. McKinney (6-4, 246) will be one of the NFL’s tallest middle linebackers, and he believes his size is a huge plus. McKinney is raw, but a terrific athlete. McKinney ran the 40-yard dash in 4.66 and has a 34-inch vertical leap. And after the Packers spent years watching A.J. Hawk get destroyed by bigger blockers, McKinney’s ability to take on blocks would be a sight for sore eyes. The knocks on McKinney are his coverage ability and overall awareness. The Packers are set for 2015 with the return of nose tackles B.J. Raji and Letroy Guion. But both players are on one-year deals, and Thompson could try finding his long-term solution in this draft. The massive Goldman (6-4, 336) has been compared to former New England tackle Vince Wilfork. Goldman gobbles up blockers and is quicker than he looks. Goldman is adept at collapsing the pocket and preventing quarterbacks from stepping up. But Goldman’s sack numbers were always somewhat pedestrian. Odighizuwa is viewed as a 4-3 defensive end or 3-4 outside linebacker. The Packers figure to have terrific depth at OLB in 2015, but Julius Peppers is 35, and both Mike Neal and Nick Perry are entering contract years. The 6-3, 270-pound Odighizuwa is a rare athlete, who ran the 40-yard dash in 4.62 seconds. He also lifted 225 pounds 25 times and had a 39-inch vertical jump. The downside is Odighizuwa sat out the entire 2013 season after two separate hip surgeries. The first was on his right side, the second on the left. “In a lot of ways when I was doing the rehab on the right side my left was taking a lot of the load and wear and tear because of that,” Odighizuwa said. This would certainly be a luxury pick. But tight end and left tackle are probably the only two spots on Green Bay’s offense without an above average starter. And could you imagine one of the NFL’s top offenses adding the draft’s No. 1 tight end? Williams, just 20, has terrific athleticism, is extremely fluid, and is most often compared to Dallas standout Jason Witten. Williams ran the 40-yard dash in a respectable 4.78. He lifted 225 pounds just 17 times, although the redshirt sophomore is still growing into his body and figures to get much stronger. Williams also has terrific bloodlines. His father, Brian, played offensive line for the New York Giants for 11 seasons. His mother, Rochelle, was a standout volleyball player at Minnesota. And his grandfather, Robert, was a quarterback at Notre Dame and was selected in the 1959 draft. Thompson has given quarterback Aaron Rodgers a remarkable number of weapons during their time together. And Thompson has been better at drafting wide receivers than any general manager in football. The Packers certainly don’t need another wideout. But you never know what’s going on inside Thompson’s head. And Green-Beckham could be a steal at the bottom of Round 1. At 6-foot-5, 237 pounds, Green-Beckham has the physical skills to be dominant. He has rare athleticism, is extremely physical and has an enormous catching radius. Green-Beckham also carries a good deal of baggage. He was dismissed from the Missouri program after allegedly pushing a woman down the stairs. Although charges weren’t formally filed, Green-Beckham could have a strike against him in the NFL’s domestic abuse category. If Thompson went in this direction, though, the Packers would have Randall Cobb, Davante Adams and Green-Beckham, all 24 or under. And Green Bay could be set at wideout for the rest of Rodgers’ career. “I do feel like those mistakes have put me back,” Green-Beckham said. “Just taking the opportunities now and not thinking about the past and just trying to look forward to just taking all the things I went through, going to Oklahoma, doing everything the right way, doing what I was supposed to do down there. NFL Draft: The ILB Dilemma: Should the Packers wait? ~Green Bay — When the Green Bay Packers are officially on the clock — and you’re frantically clicking the “Go Back” button on your remote between Game 6 of Bucks/Bulls and the NFL Draft — there’s a chance general manager Ted Thompson will have his pick of any inside linebacker in the draft. And in today’s look at the ILB’s, five are listed as realistic first- and second-rounders. So should the Packers act decisively and take the best inside linebacker on their board — and avoid missing out in the second round — or take a cornerback, a nose tackle, a tight end who may be higher on their board? Surely, Thompson will trot out to the podium afterward and tell us all he took the best player on the board regardless. Best available trumps need. It’s “the way it worked out.” You know the drill. But fact is, the Packers have drafted for need in recent years and inside linebacker was proclaimed a need by coach Mike McCarthy back at the NFL scouting combine. They like Sam Barrington a lot — and wouldn’t have cut ties with A.J. Hawk and Brad Jones if they didn’t think he could start in 2015. But they’ll be taking someone at some point. So here’s a quick review of those five players. Who would be worth taking in the first round? — Listed as the No. 1 inside linebacker in colleague Bob McGinn’s pre-draft series. — Must improve in coverage. Was not required to track backs 1 on 1 much. — Boasts the best size of the five at 6-4, 247 with a 40 ½-inch vertical. A first-team All-American last year, finishing with 244 tackles, 19.5 tackles for loss, 7.5 sacks and seven pass breakups in 39 total games (36 starts). — Scouts do not believe he runs as well as his older brother, Mychal Kendricks, a linebacker for the Philadelphia Eagles. — Read-and-react ‘backer sees the game faster than his peers. Finished with school -record 480 tackles (26 for loss) and 10 sacks. In story linked here, Kendricks explained how he knew exactly what run plays were coming in his team’s bowl win over Kansas State when the Wildcats mustered a meager 31 rushing yards on 32 attempts. “I wasn’t supposed to blitz,” Kendricks explained, “but I just got up right on the line, in the gap where I knew it’d be and made the play in the backfield. — Yet still, there are size and injury concerns. He isn’t as thick as Denzel Perryman and one team rejected Kendricks medically due to a knee issue. — Combine star posted 4.56 in the 40 — faster than 23 running backs — flashing physical traits to be a three-down linebacker. And, on the field, he isn’t afraid of contact. As one scout said in the draft series, Anthony is a “really heavy downhill guy when he hits it right.” Still, they expected to see more big plays out of someone who tested as Anthony did. — Benched as a sophomore because he was too “fat and happy and lost his focus a little” per his coach Dabo Swinney, he responded as a junior with team-high 131 tackles. Anthony said the experience humbled him, serving as a “reality check.” Also had a daughter at Clemson. — Anthony says himself he must get better with his hands on the initial contact with blockers. And does the 40 time, far better than Dawson’s clocked speed, transfer to coverage ability? — No linebacker of the five looks better on film than Paul Dawson. At TCU, under one of the best defensive minds in college football, Dawson was a wrecking ball. And on this defense trending toward a nastier, edgier direction, that’d sure be a good thing. — Also, no linebacker seemed more unprepared for the combine than Paul Dawson. Will a lack of elite (tested) size or speed — whatever your opinion on 40 speed vs. football speed — hinder Dawson at the NFL level? — While the tested numbers weren’t pretty, and you can re-watch Dawson in Indianapolis here, he still managed to make a lot of splash plays in the wide-open Big 12. He plays much, much faster. Conference’s defensive player of the year finished with 20 tackles for loss, six sacks, four interceptions and two forced fumbles. — Probably the hardest hitter of the five. One scout compared the 5-foot-11, 236-pound Perryman to Chris Borland, saying “Very good feet laterally in the box. Not great long speed. Very physical. Very similar.” Scouts also see space limitations. Perryman did not cover much in college. So if you’re Ted Thompson, do you take one at No. 30, trade down, hold your breath through the second round or trade up later on? The draft will finally begin on Thursday night. ~The Journal Sentinel’s Bob McGinn assesses the top linebackers in the draft this week. Included is each player’s height, weight, 40-yard dash time and projected round. 1. BENARDRICK McKINNEY, Mississippi State (6-4, 247, 4.65, 1-2): Fourth-year junior from Tunica, Miss. “I like him just because he’s a bigger guy,” one scout said. “I could see him filling that Dont’a Hightower role. Being that big ol’ guy taking on guards.” High-school QB started at OLB in 2012 and at MLB in 2013-’14. “Great kid, great character,” a second scout said. “Brandon Spikes wasn’t the athlete but same kind of player. Benardrick has to prove he can be impactful on third (down) and sub. Is he going to be Lavonte David or Mychal Kendricks on first and second downs as well as play third down? He’s definitely a stud vs. the run.” Finished with 243 tackles (19½ for loss), 7½ sacks often rushing from a three-point stance in sub and seven big plays (combination of interceptions, fumbles forced and fumbles recovered). “Stiff in coverage,” another scout said. “Straight-line fast. First- and second-down thumper. He can take you on.” Led ILBs in vertical jump (40½ inches). Scored 14 on the 50-question Wonderlic intelligence test. 2. STEPHONE ANTHONY, Clemson (6-2 ½, 243, 4.56, 1-2): Three-year starter from Polkton, N.C. “Runs well,” one scout said. “Really heavy downhill guy when he hits it right. He’s athletic enough to be a three-down ‘mike.’ There’s a little stiffness to him.” Started 35 of 52 games, finishing with 255 tackles (33½ for loss), 9 ½ sacks and nine big plays. “He’s a willing hitter,” a second scout said. “He doesn’t quite show up with all the flashy play-making you would think for somebody who worked out and looked as good as he did. The physicality part is not a weakness.” Some scouts say he can play three downs, others say he can’t. “Change of direction was a little bit of an issue,” a third scout said. “But he’s strong and can knock you back. He can run through gaps. I liked him. I didn’t love him.” Wonderlic of 23. 3. ERIC KENDRICKS, UCLA (6-0, 234, 4.60, 1-2): Made 42 starts. “Tough, quick, sudden, plays fast,” one scout said. “Just hurt all the time. He can blow stuff up if he wants to. He may be blown up, too.” His brother, Mychal, was a mid-second round pick by the Eagles in 2012 and has started ever since. Eric scored 32 on the Wonderlic compared to 14 for Mychal. “He can run but he’s not his brother (he ran 4.46),” a second scout said. “He probably can play three downs effectively.” Started at RILB in coach Jim Mora’s 3-4 defense. “He’s too small to thrive in a 3-4,” a third scout said. “Between his instincts and his willingness, he can do it. But you wouldn’t be playing to his strengths if you made him play uncovered in a 3-4.” Finished with UCLA-record 480 tackles (26 for loss), 10 sacks and 11 big plays. “He’s really, really small,” a fourth scout said. “Perryman is small, too, but he’s thick. Kendricks has a different sort of body type.” Rejected medically by one team (knee). From Fresno, Calif. His father, Marv, was Bruins’ leading rusher in 1970-’71. 6. JORDAN HICKS, Texas (6-1 ½, 234, 4.65, 2-3): Suffered a broken foot, hip flexor and torn Achilles in a five-year career. Healthy in 2014 and had finest season. “He’s got feet for the passing game,” one scout said. “He is physical. He can run. And he’s really smart (Wonderlic of 28). He grew as the season went on.” Started 28 of 45 games, finishing with 299 tackles (24 for loss), 5½ sacks and three big plays. “Good lateral player but he’s not a take-on guy at all,” another scout said. “Drops (into coverage) easy. He’s a space guy. Sit and catch.” From Cincinnati. 7. JAKE RYAN, Michigan (6-2 ½, 240, 4.65, 3-4): Started at SOLB for two years in a 3-4 before suffering a torn ACL in March 2013. Returned as MLB in mid-’13 and was Wolverines’ MVP playing there last season. “Most people pooh-pooh him a little bit,” said one scout. “Pretty good player.” Old-fashioned type with 41 starts in 46 games. “Sort of old-school tough guy,” another scout said. Finished with 267 tackles (45 ½ for loss), 9 ½ sacks and 11 big plays. “He’s smart (Wonderlic of 22) but there’s nothing special about him,” a third scout said. “He will have some cover limitations and he’s not a great open-field tackler, either.” From Westlake, Ohio. 8. RAMIK WILSON, Georgia (6-2, 237, 4.68, 4): Two-year starter. “He can really turn and run,” one scout said. “In a confined area he struggles because he’s a long strider. He’s best suited as a ‘will’ in a 4-3 where he can be an old hit and run linebacker. That’s more of his thing. Not the most physical guy at the point of attack.” Finished with 253 tackles (19 for loss), six sacks and two big plays. “Long kid (33-inch arms),” another scout said. “Does have some strength. The toughness is real inconsistent. He’s a little stiff.” From Tampa. 9. HAYES PULLARD, Southern California (6-0 ½, 237, 4.73, 4): Started three seasons, including the last two in the middle. “He steps up, takes ’em on, sheds ’em,” one scout said. “Smooth and fluid getting back in the pass drop. He has a quick plant and break to the receiver or ball carrier. Quietly, he is a really, really good football player. He was the one that kind of kept that defense together.” Finished with 377 tackles (25½ for loss), six sacks and seven big plays. “Good kid, plays hard, can’t run, kind of stiff,” another scout said. From Inglewood, Calif.
10. TREY DePRIEST, Alabama (6-0 ½, 256, 4.93, 6): Started three straight years at MLB for coach Nick Saban. “He ran the whole defense,” one scout said. Ran and tested poorly at the combine. Finished with 237 tackles (17 ½ for loss), two sacks and four big plays. “I over-graded him a year ago,” another scout said. “He let himself get fat and messy. I was hoping he’d be a Vontaze Burfict guy, a guy who didn’t run fast but wound up being a good player.” From Springfield, Ohio. 1. DANTE FOWLER, Florida (6-2 ½, 263, 4.59, 1): Third-year junior from St. Petersburg, Fla. “Real tough guy,” one scout said. “Plays hard. Can run. Really heavy hands. He’s not elite at anything, but you like the kid and the effort and the toughness. He’s not a Khalil Mack type athlete.” Two-year starter with 33 3/4-inch arms. “They had him doing so much there,” another scout said. “People truly didn’t get to see him just take off and be what he’s going to be in the NFL. He’s a lot like Clay (Matthews). They just have that relentless approach. He’s wired the right way. The big-time rushers are those guys that can put their hand in the ground and drive them back. That’s Clay, Julius (Peppers), Mario (Williams), Dwight (Freeney). Dante has a power game, too.” Two-year starter with 140 tackles (33½ for loss), 14½ sacks and seven big plays. “He brings that (Robert) Quinn type ability,” a third scout said. “He has the ability to accelerate his feet as he works his hands. Those guys are rare. He’ll have to be taught to play the run.” Wonderlic of 16. 2. RANDY GREGORY, Nebraska (6-5, 235, 4.62, 1): Played two seasons in junior college and two at DE for the Cornhuskers. “He is the best natural pass rusher,” one scout said. “There’s no question. He also has the biggest chance to bust. He’s a freak. (Tall), tremendous feet and burst.” Finished with 120 tackles (25½) for loss, 17½ sacks and five big plays. “He’s got great get-off, flexibility and is extremely disruptive,” a second scout said. “He has the ability to affect the game like Jevon Kearse (6-5, 262, 4.48).” Said he played as high as 258 pounds but was 235 at the combine, 238 at pro day March 5 and 228 on a team visit within the last 10 days. “He’s got a light load,” a third scout said. “He gets his (expletive) kicked around in the run game. Dropping into coverage will be a little bit of an issue. He hasn’t done that. The only thing you can do with him is be a designated pass rusher.” Part of a military family, he lived in several states before attending high school in Fishers, Ind. Missed time with several major injuries starting in 2011. Wonderlic of 28. 4. SHANE RAY, Missouri (6-2 ½, 247, 4.67, 1): Fourth-year junior from a rough section of Kansas City. Backed up Kony Ealy and Michael Sam for two years before breaking out with 14½ sacks in ’14. “One of the best first steps I’ve seen in recent memory,” one scout said. “He’s the best since Von Miller as far as explosiveness. He doesn’t have that Gumby bend around the corner but his first step is pretty dang good.” Finished with 120 tackles (34 for loss), 19 sacks and six big plays. “He’ll get swallowed up some but so will Beasley,” another scout said. “They all will. He’s got violent hands and great technique. Plays angry. Not the physical freak some of the others are.” Two scouts said he was better than Ealy. “What special quality does he have?” another scout said. “He’s not real big and physical. He doesn’t have great athletic skills. But he’s a good player.” Wonderlic of 20. Played DE at Mizzou. “No way in hell he can be an outside backer,” a fourth scout said. “He has a degree of stiffness.” Ray reportedly was cited Monday morning for possession of marijuana (less than 35 grams) and a lane violation in Cooper County, Missouri. 5. BUD DUPREE, Kentucky (6-4, 268, 4.61, 1): Played OLB in 2011-’12 (15 starts) before switching to DE (23 starts) in 2013-’14. “He didn’t do a lot on tape this year but he’s the rarest of the size-speed-movement guys,” one scout said. “In terms of rare NFL body, he’s probably No. 1 on the board. He’s not Terrell Suggs’ personality.” Extremely mild-mannered and soft-spoken to the point he’s difficult to hear. “Something’s missing with this guy,” a second scout said. “He’s a tight end playing defense. When he busts he can play tight end. You’ve got to put his hand down and let him rush. Don’t ask him to do anything else.” Scored 12 and then 13 on the Wonderlic. “I just don’t think he’s real smart,” a third scout said. “He’s got no instincts.” Finished with 247 tackles (37 for loss), 23 ½ sacks and six big plays. His jumps (42 vertical, 11-6 broad) paced LBs. “He’s an enigma,” said a fourth scout. “Some games he just didn’t show up. He came in as a tight end, and he probably could be one. But he put on a show at pro day. He showed first-step explosion, pass rush, ability to drop, redirect in space. Good kid. Got too many good qualities not to make it.” From Irwinton, Ga.
6. SHAQ THOMPSON, Washington (6-0, 228, 4.59, 2): Won the Paul Hornung Award as the nation’s most versatile player. “He’s played running back, safety, linebacker,” one scout said. “He hasn’t played linebacker very much. Lavonte David was much more instinctive. You hope if he just sticks to one position he can learn how to use his hands, which he doesn’t now.” Despite averaging 7.5 yards in 61 rushes, he has told teams he wants to play only LB. “I don’t see him as a backer,” another scout said. “Once he sees the ball he is so quick and so explosive he can make plays, but I don’t think he’s instinctive.” Finished with 233 tackles (15 for loss), 3½ sacks and 13 big plays (four defensive TDs in ’14). “I think he’s another Adam Archuleta,” a third scout said. “Archuleta played linebacker and they moved him to box safety and blitzed him. Same guy.” Had an unsuccessful stint in 2012 as a minor-league outfielder. Third-year junior. “They (Husky coaches) were so tired of him they virtually said to him, ‘You’ve got a great shot. It’s probably best for you to go this year,'” a scout said. “He made a lot of stupid 15-yard penalties. I was surprised (coach) Chris Petersen put up with him.” From Sacramento. 7. NATE ORCHARD, Utah (6-3 ½, 250, 4.84, 2): Started 36 of 50 games at DE. “Plays his (expletive) off,” said one scout. “Highly productive. The (40) is the only negative.” Former WR with long arms (33¾). “As a 3-4 outside backer he could choke down a tight end,” said another scout. “He’d be good enough to drop in the flat for a 3-4 team. He’s physical on pass rush. Good leverage rusher. On run he didn’t play great all the time.” Finished with 186 tackles (38½ for loss), 25 sacks and 13 big plays. “Long, thin arms and legs…but really well-defined,” a third scout said. “Smart (Wonderlic of 21), instinctive player. Strings play out along the line of scrimmage. Kind of a quiet guy. Lots of room to get better in this player.” From Salt Lake City. 8. KWON ALEXANDER, Louisiana State (6-0 ½, 227, 4.56, 2-3): Made to order for weak side in a 4-3. “I don’t think he could be a ‘mike,'” one scout said. “He’s not instinctive enough. But as a backside chase player, that’s his cup of tea. He can run.” Started 23 of 32 games, finishing with 156 tackles (15 for loss), 1½ sacks and five big plays. “Good football player,” another scout said. “Run and chase guy.” Third-year junior from Oxford, Ala.
9. HAU’OLI KIKAHA, Washington (6-2 ½, 251, 4.92, 3): Led the nation in sacks last season with 19. “He’s a really polished guy,” one scout said. “Plays really, really hard. Don’t know how innately gifted he is but a pretty good player.” Played DE from 2010-’13, but his ’11 and ’12 seasons were cut short by a torn left ACL. Several teams said the knee isn’t an issue now. “I don’t know if he’s got the agility and the athleticism to stand up and play backer,” a second scout said. “Very smart (Wonderlic of 29). He’s a situational pass rusher is what he is.” Finished with 206 tackles (51½ for loss), 36 sacks and eight big plays. From Hau’ula, Hawaii. 10. LORENZO MAULDIN, Louisville (6-3 ½, 255, 4.83, 3-4): Played alongside Marcus Smith, the Eagles’ surprising and disappointing first-round pick (No. 26) last year, for three seasons. “He’s a better player than Smith,” one scout said. “He’s got some bulk. He played kind of a defensive end this year but he played linebacker in the Senior Bowl and didn’t look completely out of place. He’s more physically equipped than Smith.” Finished with 113 tackles (31½ for loss), 20½ sacks and five big plays. “He plays hard,” another scout said. From Atlanta. ~Green Bay — The world record doesn’t mean much at all to him. 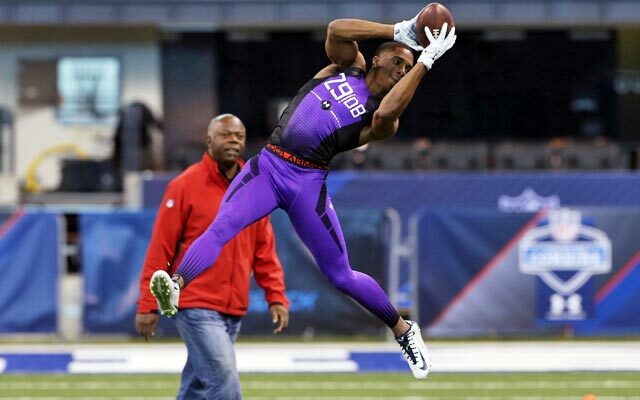 Sure, Byron Jones took the NFL scouting combine by storm with his 44½-inch vertical and record-setting 147-inch broad jump. 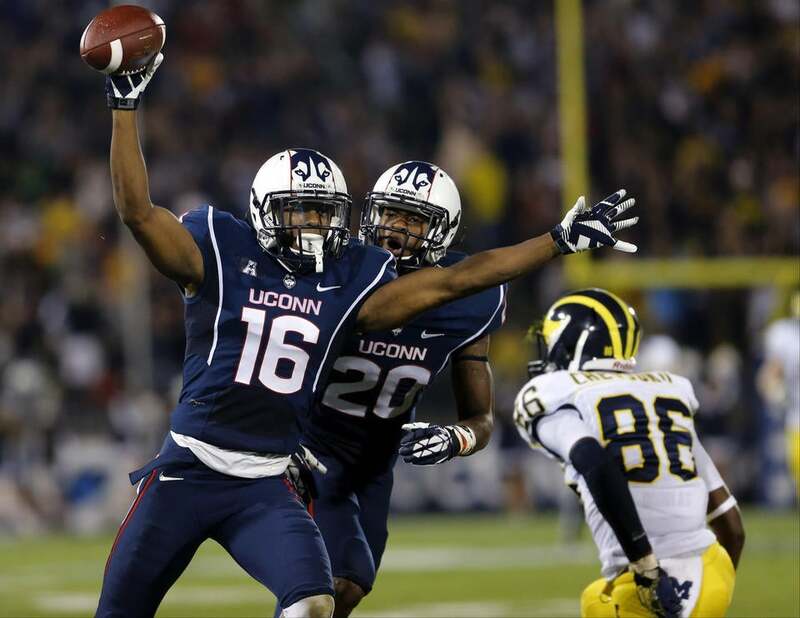 In the latter event gone viral, the Connecticut cornerback resembles a human pogo stick or some half-human, half-amphibian species. It was a leap perhaps worthy of the Guinness Book of World Records, but…so what? Fake bait. No minnows, no earthworms. The reason Jones has gained national acclaim, of course, is the 12-foot 3-inch broad jump. Athleticism absolutely differentiates Jones. The last two months, this 6-foot-1, 199-pound, safety-to-cornerback convert has been asked about the broad jump almost daily. Part of him is flattered by the reaction. Part of him wishes the discussion was about football. There’s more to the prospect than one event. After starting 12 games at safety in 2012, Jones moved to cornerback in 2013 and finished with 60 tackles, eight pass breakups and three picks. Last season, in seven games before season-ending shoulder surgery, Jones had 24 tackles, four pass breakups and two interceptions. First, Jones was meticulous in his film study starting with an opposition’s first- and second-down runs, then moving to play-action plays, then to third-down calls. He uses a play in a 31-21 loss to East Carolina as one example. By the formation, he knew a receiver was about to set a pick on him. Jones said he “definitely” can bring this element of his game to the NFL. No question, athleticism is the ace up his sleeve. While he was able to work his legs in the weight room — which obviously showed — Jones trained specifically for the combine for only three weeks due to the torn labrum that ended his senior year. No, he wouldn’t be required to leap-frog in Dom Capers’ defense in Green Bay. Even Jones admits a broad jump itself doesn’t transfer. Yet it does hint at explosion. And his vertical — 3 inches higher than any other cornerback in Indianapolis — hints at a trait all NFC cornerbacks need. In a division that features Calvin Johnson (6-5, 236), Alshon Jeffery (6-3, 216) and Martellus Bennett (6-6, 265), Jones might be an ideal jump-ball buster, while also possessing enough quickness to hang with Mike Wallace (4.33 seconds in the 40) and Golden Tate underneath. Jones’ time of 3.94 seconds in the 20-yard shuttle ranked third-best overall at the combine. And as Packers draft picks past indicate — Casey Hayward, Micah Hyde, Nick Collins — general manager Ted Thompson prefers defensive backs who’ve played inside and outside and at safety. When he wasn’t reading a receiver’s splits, when he wasn’t fishing, Jones was a political science major and economics minor. He spent one summer interning in Washington, D.C., with U.S. Representative Elizabeth Esty of Connecticut. Jones trained with the George Washington University women’s basketball team in the morning, swapped gym clothes for a suit and interned from 8 a.m. to 6 p.m. The experience was “challenging,” he said, even “eye-opening.” One of his primary jobs was to respond to mail — be it voice mail, email or letters. GREEN BAY – The NFL did it again. The league has scheduled the Packers for another rugged start to the season. The Packers will open the 2015 regular season with an NFC North showdown at Chicago on Sept. 13, followed by the NFC title game rematch with Seattle in a Sunday night home opener on Sept. 20.